The dates and venues have now been announced for the inaugural Ducati 848 Challenge race series which will be held over eight rounds including two televised BSB rounds and two overseas rounds at Misano and Assen. New Era Motorcycle Club, in association with Ducati UK and Chris Bushell (Ducati Desmo Due series organiser), have joined forces to launch this prestigious ‘one-make series’ based on Ducati’s stunning 848 Superbike. The series will not only feature one of the most iconic motorcycle brands but also visit four world championships circuits - two of which will be overseas rounds at Assen and Misano. The Assen round will be held during the ‘Ducati Club Races’, Europe’s biggest amateur race meeting. This will be followed by the double race at the Misano Circuit during the famous Ducati festival - World Ducati Week. The new one-make Ducati series kicks off with a visit to Silverstone on the 25th April followed by a round at Oulton Park on May Bank Holiday. This is the first of two BSB support races that includes the Brands Hatch GP circuit in August. Three other UK rounds include Snetterton, Castle Combe and the final round at Cadwell Park on the 2nd and 3rd of October. Interspersed between the UK races are two back to back overseas rounds with visits to Assen on the 29th and 30th May and Misano 12th and 13th June. This new series is organised by Chris Bushell (Ducati Desmo Due series organiser for past five-years) in conjunction with Ducati UK and the New Era club. He told MCN: “This is a race series for modern Ducati Superbikes run to Superstock rules. The big news is the chance to race at the World Ducati Weekend in front of 50,000+ Ducati fans at Misano. A new or used Ducati 848 will be needed to compete and many Ducati dealers have prepared ‘race packages’ to assist potential entrants. There will be a maximum grid of 38 riders and registration to the eight round series will cost £250 (including Misano round fees) and then just £145 per round. 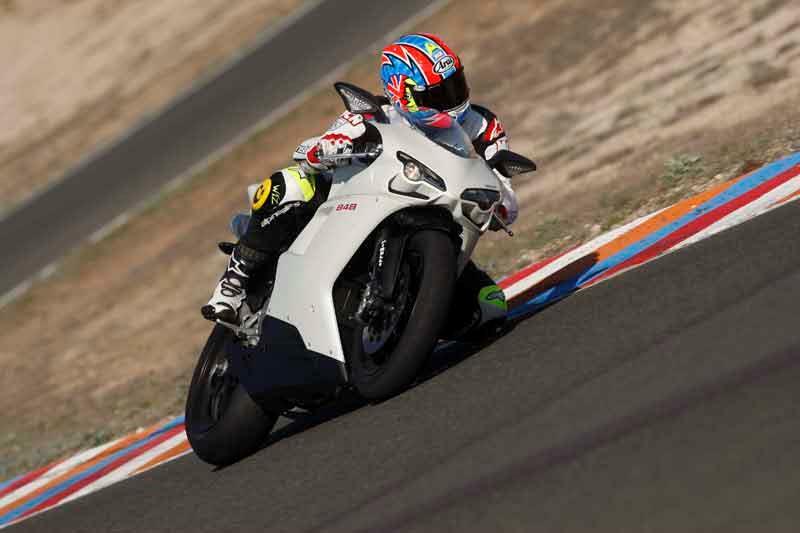 Bushell added: “Serious cost control is built into the Ducati 848 Challenge. Apart from crash damage, you’ll be able to work out your budget and stick to it. There will be a Dunlop control tyre, the D211 GP Racer, to harness the 134hp and 70.8lb-ft of torque and enhancing already one of the finest handling bikes in its class. The Dunlop tyres will be at a very competitive price adding to the cost controls incorporated into the championship. The prize list is still being compiled but is likely to include product prizes (Dunlop tyres for race winners are confirmed). he full prize list including supporting awards such as ‘Rider of the day’ will be announced shortly. The 848 Challenge has been launched by New Era Motorcycle Club and is supported by Ducati UK and administered by Chris Bushell. There will be two races at each of the UK rounds. At Assen there will be one longer race and at Misano it is anticipated there will be two races. The regulations for the series are based on the FIM World Superstock regulations. They have however, been updated to reflect the fact that this is a one make series.